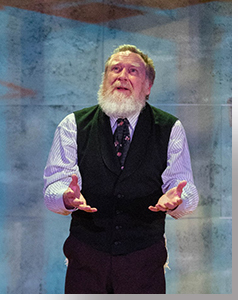 Our perception of virtually every play in the Shake-spearean canon is influenced by whom we believe wrote it, as the regional premiere of Aaron Posner's District Merchants reveals in the discussions that have ensued regarding the original script and this adaptation. For those who believe the premiere theatrical works of the ages were composed by a borderline literate grain dealer turned actor from Stratford, their perception of the Merchant of Venice and its adaptations tends to characterize the play as anti-semitic, given the British Decree of Expulsion of the Jews in the 12th Century and the resultant virulent public behaviors; on the other hand, those who believe that the works were composed by a particular nobleman1—educated by the greatest minds of the Renaissance and informed by his extensive travels on the Continent, particularly his time in Venice—tend to see the play as a depiction of anti-semitism by its "Christian" characters, based on the playwright's actual experiences with the inhabitants of Venice and its Jewish ghetto, as well as a £3000 investment with a Michael Lok, in an ill-fated maritime trade venture, shortly after his return to England from Venice. 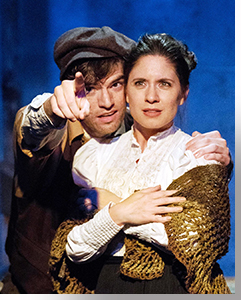 In Posner's adaptation, now running at Miners Alley Playhouse, the setting is Washington, District of Columbia, in the years following the Civil War. Shylock (Chris Kendall) is still a money lender, and his daughter, Jessica (Amy Elizabeth Gray) still bristles under his inflexible rules. 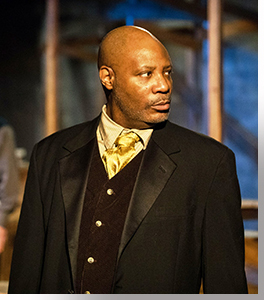 But in this case, Shake-speare's Antonio becomes Antoine Dupree (Cris Davenport), a free African-American enjoying the unrestricted entrepreneurial free-for-all on the streets and in the backrooms of the nation's capitol. And like the original story, Antoine ends up securing a loan for (Benjamin) Bassanio (Sinjin Jones), who in this adaptation is a black passing for white. Posner does not dwell on the details of how Bassanio spends his money, other than in an obvious wardrobe upgrade and a gift to an acquaintance, but the principle objective of his expenditures is to facilitate his relationship with Portia (Candace Joice), who is, eventually, won over by him, before he reveals his secret. So, in turn, Antoine's inability to repay Shylock is based, not on the sinking of a merchant ship, but on the crash of the stock market. This is somewhat of a loose end in the tale, because it effects Shylock as well, which makes us wonder how he maintains himself after the loss of his fortune at the hands of his daughter and the professional scoundrel who tickles her fancy. As with so many adaptations of Shakespeare, when interdependent elements are altered, gaps show up in the plotlines. Despite this distraction, the centerpiece of the dramatic arc remains the trial, where the scenario in this play diverges from the original, and Shylock is given two new wrinkles: a speech in which he questions the morality of the state, given its slaughter of Native Americans and African-Americans, and the choice to take his pound of flesh. At key points throughout the play, Posner provides freeze-frame moments for each member of the ensemble to address the subtext of their situation via a soliloquy, but at this moment he chooses a blackout, which not only forces us to ponder the forces that brought to bear this confrontation, but adds immeasurable drama concerning the outcome. 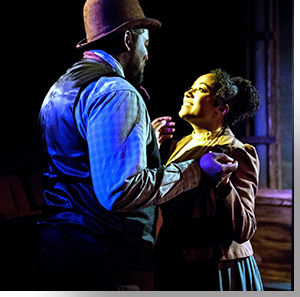 In the traditional categorization of the Shake-spearean canon, The Merchant of Venice is classified as a comedy, because, no one dies and Bassanio and Portia marry, which also happens in this version; but, Posner takes it further, marrying Nessa (Kristina Lorice Foutaine), Portia's African-American servant, with Lancelot (Isaiah Kelley), Shylock's African-American servant, as well marrying Jessica and Finneus (Finn) Randall (Sean Michael Cummings). All of this works splendidly, because of Shylock's surprising choice. All the performances are wonderfully drawn: Kendall brings a mountain of gravity to Shylock, packing his pronouncements with a wallop that underscores Shake-speare's intentions; Davenport is equally profound, filling Antoine with a profusion of passion for his free state and diversified life; in Jones' nuanced portrayal, Bassanio's double life is never far from the surface, much as Gray deftly navigates Jessica's two sides—obedient daughter and cultural renegade; we see a besmitten, but silver-tongued devil in Cummings' Finn; Joice's nuanced portrayal of Portia—intelligent, caring, and naive—sets up an incredible scene with Jones that speaks volumes about Posner's skills as dramatist, and Joice's talent; Nessa is a major force in Portia's maturation, as well as a catalyst for much humor, in Fountaine's sublime portrait; and, Kelley serves as a steady, upbeat throughline via Lancelot's munificent good humor and sly analysis. 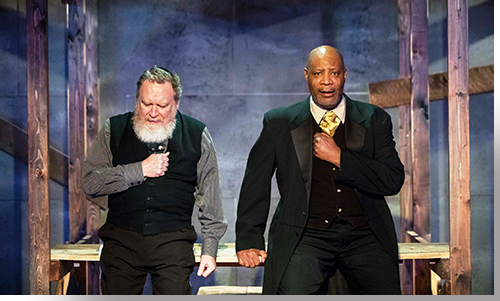 Posner's thoughtful update of Shake-speare's Merchant reveals truths in the original play much as did another adaptation, Brian Freeland's 1999 world premiere in Denver of The Merchant of Auschwitz, where the transposition of Antonio, Bassanio, and Portia as Nazis (without changing a word in script) made the interpretaton of Shylock's behavior—as mirroring the "Christians"—an altogether obvious intention of Shake-speare. 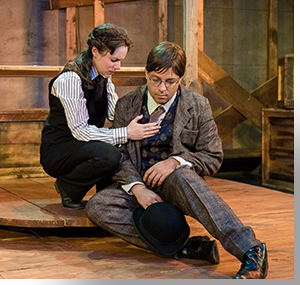 Miners Alley Playhouse's presentation of District Merchants, by Aaron Posner, runs through June 24th. For tickets: https://www.minersalley.com/.